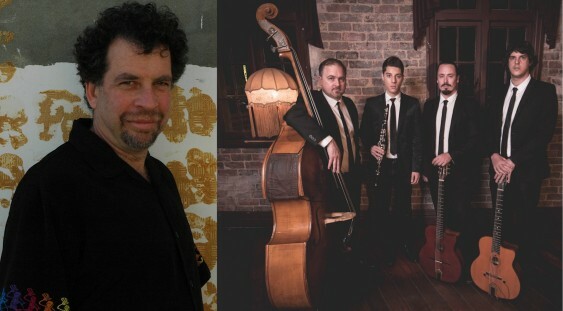 Formed in mid 2015, Sassafras has quickly established a reputation as one of Perth’s premier gypsy jazz groups. Perhaps best known for their work with the quintet version of the group (“Sassafras” – featuring vocalist Jessie Gordon), the four instrumentalists have also been steadily developing their sound as a tight-knit and energetic instrumental group: Sassafras Quartet. Joining Sassafras Quartet for this special occasion, is none other than Grammy-award-winning, world renown pedal steel player Lucky Oceans. Having already joined forces for a performance at Fremantle’s Kidogo Arthouse in March of this year, Sassafras Quartet and Lucky Oceans were so pleased with the result that a follow up performance was a no-brainer. Repertoire for this special event will consist of gypsy jazz classics (from luminaries such as Django Reinhardt, Birelli Lagrene and Gonzalo Bergara) alongside re-worked jazz standards, some western swing and probably a bit of country too. Throw in a few original tunes from the band, and some South American flavours as well, and you have all the ingredients for an engaging and eclectic night of music. Lucky Oceans was born into a music loving family in Philadelphia, Pennsylvania, USA in 1951. He married Australian Christine Haddow in 1979 and settled in Fremantle, Western Australia a few years later. He co-founded and named the group Asleep at the Wheel, playing pedal steel guitar with the group for most of the 70s, and winning two Grammy Awards (1978 and 1993) for Best Country Instrumental with them. He writes music for film and television and has toured and recorded with Paul Kelly, The Black Sorrows. He was an Australia Council Music Board member from 2001–04. He wrote and taught the University of Western Australia’s Music in World Cultures course and presented a TEDx talk on improvisation. Currently Lucky leads his own group and also plays with the Zydecats, a group he co-founded in 1993. He hosts an annual live concert series called Sonic Sessions in which he interviews and plays with musicians at the Fremantle Arts Centre. He is listed in Hugh Gregory’s book, 1000 Great Guitarists and has been called ‘one of the most influential steel guitarists of his generation.’ He has a broad knowledge of music and is a fluent player of jazz, folk, blues and country styles.